This fingerprint lock makes it easy to secure your stuff at the gym, school, or any time you want to go key-free. Biometric technology makes your fingerprint the key that opens the durable pick- and water-resistant lock. Benjilock by Hampton can store up to 10 fingerprints, is USB rechargeable, and even has a set of keys for extra peace of mind. Dimensions: 3.08" x 1.68" x 1.06"
Gave this to Grandson, that’s in the Air Force. He says he likes it a lot. Best lock I’ve ever own. Super happy with my investment. Very unique. I loved the idea and it met my expectations. Robbie Cabral created a fingerprint lock to solve that “where’s-the-key?” hassle and make it easier to secure—and access—your belongings. 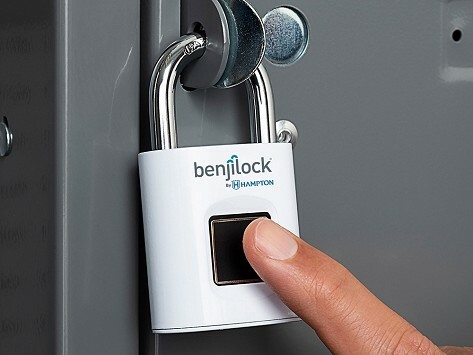 Benjilock by Hampton looks like a traditional padlock but built-in biometric technology uses your fingerprint like a key. It can store up to 10 different fingerprints of trusted users (pro tip: make a list) and is USB rechargeable. The lock will last about six months before needing to power up and there is a set of back-up keys to gain access, too. The strong and durable lock is pick- and water-resistant to help with all sorts of securing jobs. Robbie was at the gym when the idea for a keyless lock struck him. At the gym, at school, or anywhere around the house—Benjilock by Hampton is a smart and easy to use solution.